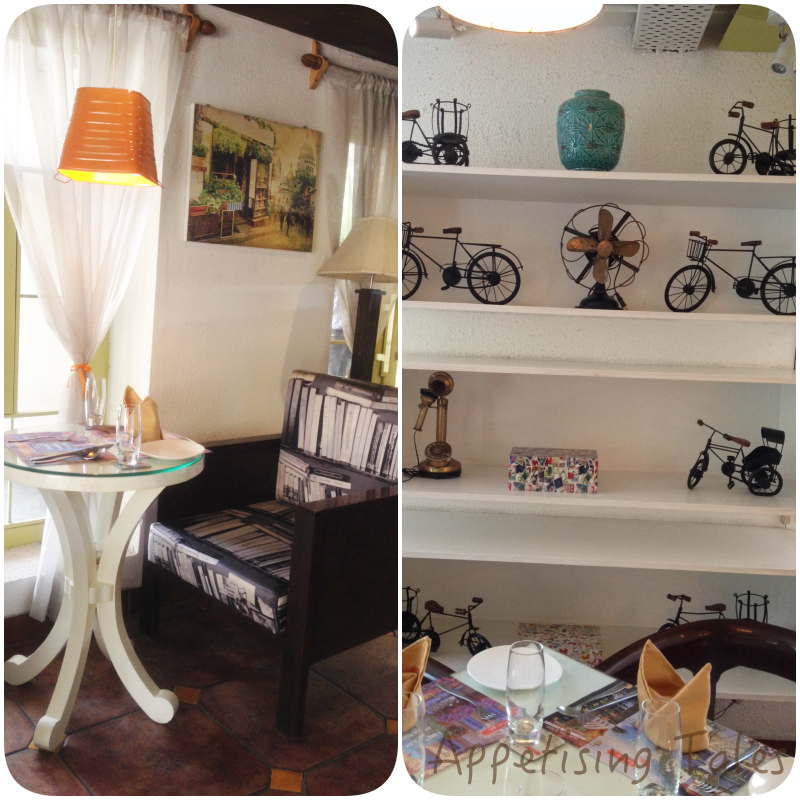 Schengen – Deli-Bistro-Pub has amped the party quotient in its otherwise quiet neighbourhood. Located in the diplomatic area of Chanakya Puri, the Malcha Marg market has always had more than a few restaurants. Be it Fujiya, Moti Mahal, Lazeez Affaire, Fez or Side Wok, each restaurant has enjoyed its share of regulars. And even though the same market housed nU Delhi Q’ba featuring live music that attracted a lot of rock music lovers, the place was invariably quiet on the outside. The first time I noticed Schengen was a few weeks ago while driving past it one evening. The bright lights and loud music create quite a buzz in the area. Good or bad? That depends on your preference I guess. In my opinion, Delhiites have an affinity for the bold and the bling. But, don’t get me wrong! Schengen is not just for the night birds. Spread over three floors, it opens for breakfast and serves pan-European fare through the day. The ground floor has a little seating area and the bakery and dessert counter. The first floor is the dining section, and a lovely terrace covered with white gravel. And the bar on the second floor usually gets busy 6pm onwards. I’m happy to note that the place is quite busy even for a weekday lunch. The bright interiors (at this time the brightness comes from the daylight streaming in through large glass windows and doors) are buzzing with an assortment of people – a few media personalities, an old couple, a business meeting in progress and a bunch of college-going kids. 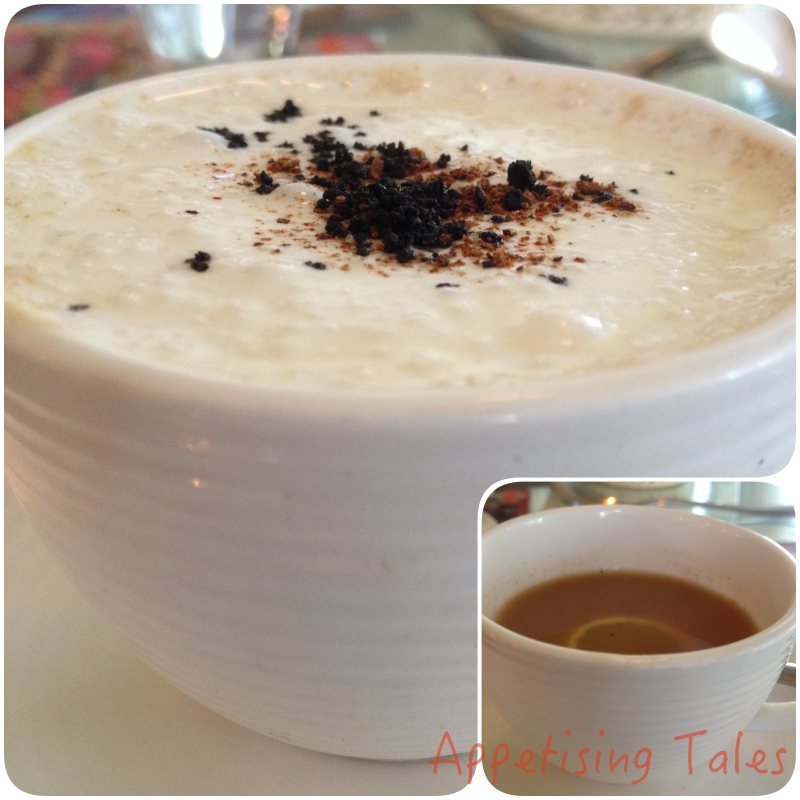 The Wild Mushroom Solyanka Cappuccino; Inset: Bulgarian Sour Lamb Soup. We start with the Bulgarian Sour Lamb Soup. A traditional soup of Bulgaria, the tangy, slow cooked broth has small chunks of tender lamb. It is quite tasty but I prefer the Wild Mushroom Solyanka Cappuccino. As the name suggests, it is an exotic mushroom soup served with parmesan cream foam. The soup is delicious on its own, but what I love is that one can actually taste the cheese in the foam. I’ve had something similar in other places where the parmesan in the foam is only for namesake. Then comes the Watermelon and Feta Salad. Simple and refreshing in its taste, I appreciate the plating – the watermelon has been scooped into neat balls and the salad, tossed with pine nuts and rocket leaves in a honey mustard dressing is served in a watermelon shell. Bottom Left: Warm Tomato and Mozzarella Stack; Bottom Right: Spanakopita. 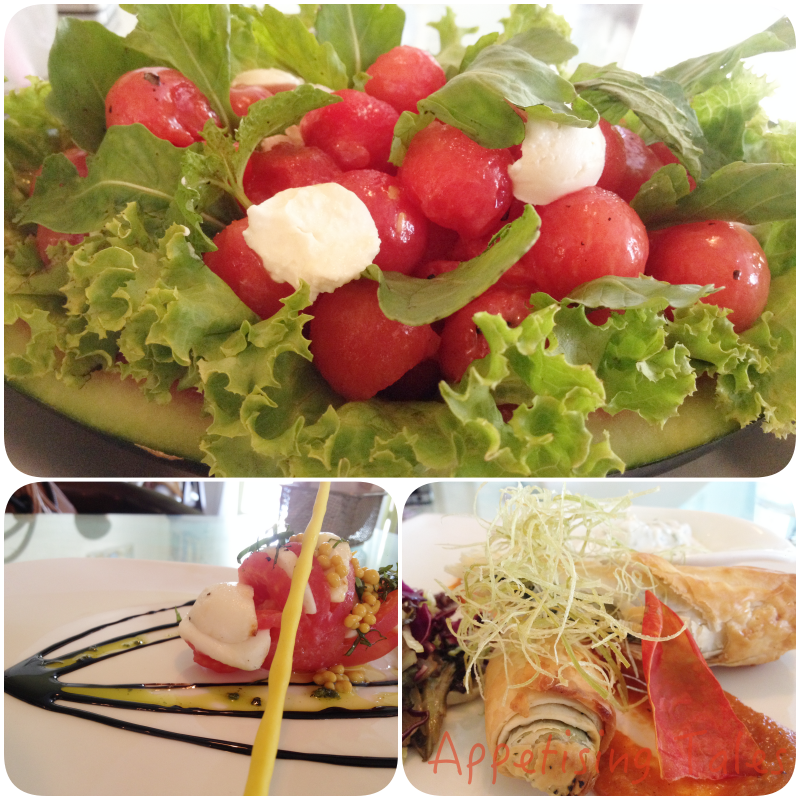 Going by corporate chef, Piyush Jain’s recommendations, we try the Spanakopita and a Warm Tomato and Mozzarella Stack. While the former is phyllo wrapped spinach, feta, onion and ricotta rolls served with tzatziki the latter is the chef’s take on the Caprese salad and is essentially a stack of slow roast tomato, fresh mozzarella, basil and polenta breadstick served with balsamic caviar. The plating, again, is beautiful! There’s also a touch of molecular gastronomy since the “man made caviar” is made with tomato, mustard and balsamic. Let me tell you right away that the Pizzas are fab. Freshly made in a wood fired oven, the dough is made with part whole wheat making it healthier. That it is a thin crust and nicely loaded with toppings, makes it fantastic. We have the half and half, the vegetarian side includes corn, olives, jalapeño, asparagus, mushroom, spinach, tomato, cherry tomatoes and artichokes and the non veg side has all that plus smoked chicken, pepperoni, chicken meatballs. 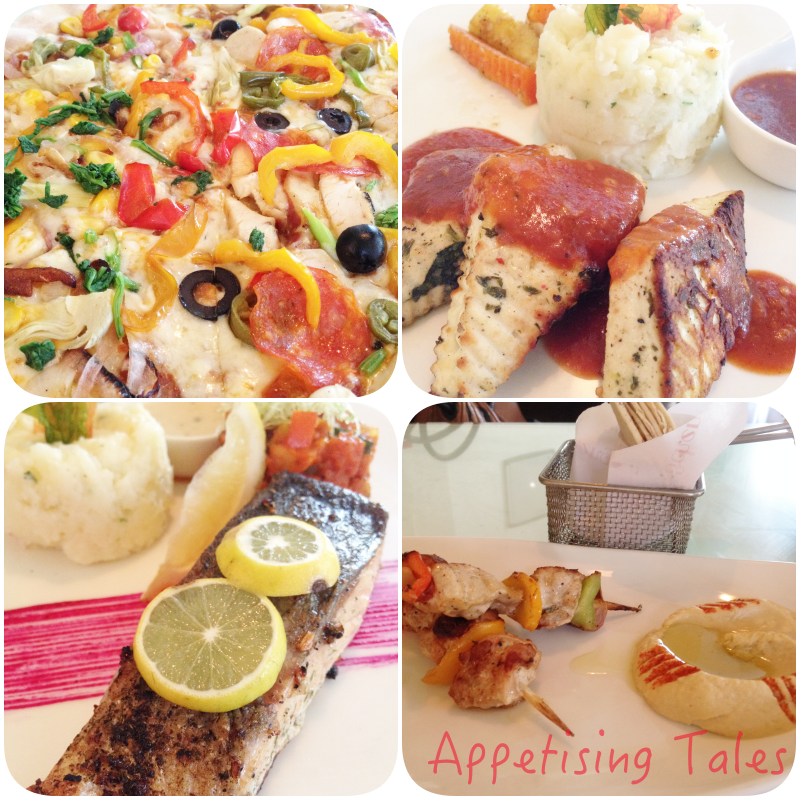 Clockwise from Top Left: Half n Half Pizza; Cottage Cheese Steak; Chicken Skewers; Pan Grilled Salmon. At this point, we don’t really need the mains, but we do sample a couple. The Grilled Cottage Cheese Steak is stuffed with spinach and served with sweetened bourbon sauce. The sauce is delicious and really lifts the flavour of this dish. The Pan Grilled Salmon Steak on the other hand doesn’t quite work for me. Served with ratatouille, mash potato, lemon tobiko cream, I find the fish a tad dry. I even prefer my mashed potatoes to be smooth and creamy even if it makes them more sinful. 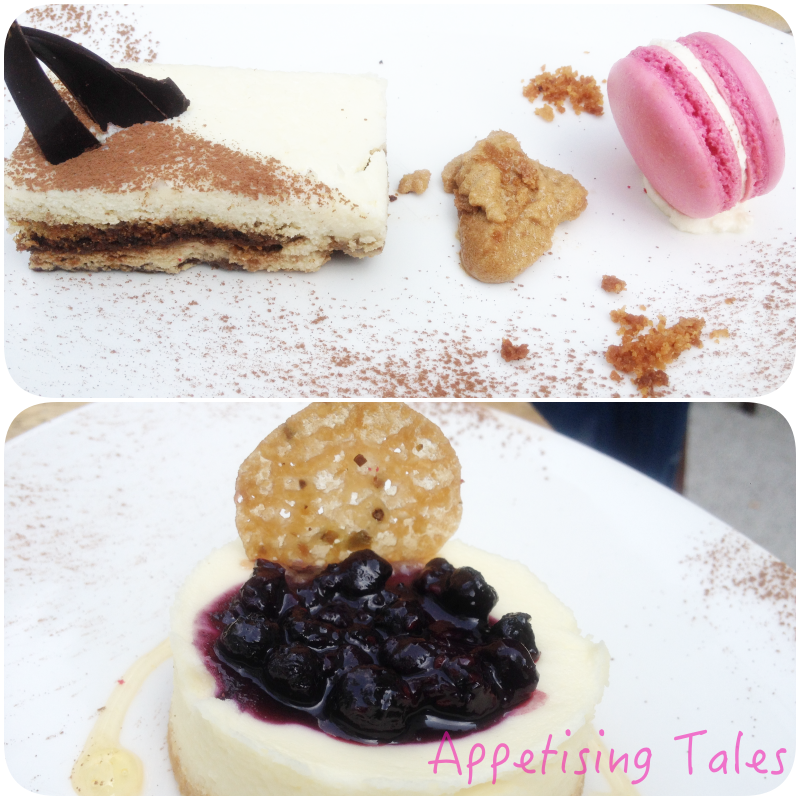 Top: Schengen Style Tiramisu; Bottom: Blue Berry Cheese Cake. A word regarding the desserts – they all sound too sweet even for desserts! To give you an example, the chocolate fondant comes with honeycomb and the red velvet is served with a crushed macaroon. We go for the Schengen Style Tiramisu that is served with a strawberry macaroon and coffee froth and the Blue Berry Cheese Cake served with blue berry compote. Honestly, I would be just fine with a good tiramisu or a cheesecake, without the extra accompaniments. But overall, I would recommend you to try out Schengen. One, its away from other congested areas of Delhi. Two, the food and ambience are good. And three, there’s enough choice from Italian to Greek and Turkish, the traditional fish and chips to a range of burgers and pizzas. I would go back for the pizzas and to try their breakfast. 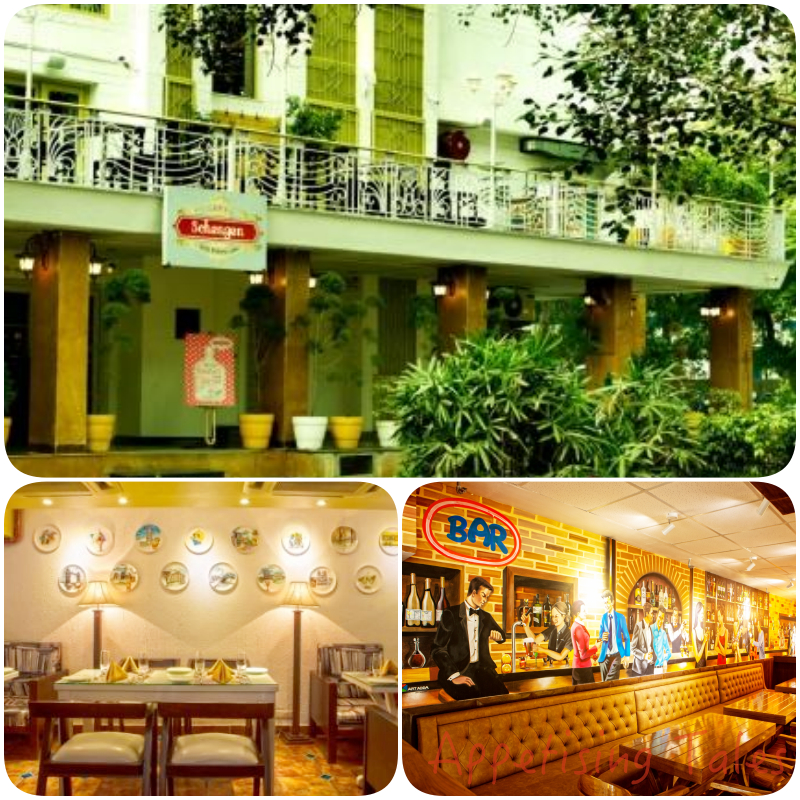 Schengen – Deli-Bistro-Pub, 22/48, Malcha Marg, New Delhi. Prices Soups Rs 225 onwards; Salads Rs 325 onwards; Sharing Plates Rs 185 onwards; Burgers Rs 255 onwards; Pizzas Rs 475 onwards; Mains Rs 425 onwards; Desserts Rs 225 onwards.